The val padana, for those who don't know, is very flat. Everything looks flat from the window of a plane, even mountains are squashed and foreshortened, but the val padana doesn't leave any room for topographical speculation, it is flat and fields and swept with the swirling lines of tributaries and tractor trails and everything is in mud coloured, from a pale sandiness to a rich brown, at least in this season and from this plane. Monza begins with Theodelinda, lombard queen on a mission: to find somewhere breezy to spend the long hot sunmmers in the val Padana. And to build, of course, a nice church, standard practice for the 8th century. She dedicated the church to John the Baptist, who of course was beheaded, or as it's usually put in Italian, decollato a word that always make me look twice as it means 'un-necked', but also, in modern parlance, 'take-off' as in a plane. Surely the patron saint of airports, then? Oh I'm not going to explain that here it is much too hot. Above is the redoubtable Theodelinda, anachronistically holding 'her' cathedral like toy or a relic or a prayerbook. In reality the facade, and this sculpture, are products of a much later age when, eager to cash in on the impeccable credentials of a long dead pious monarch, in 1300 or thereabouts, or roughly the heyday of Canterbury as a point of pilgrimage, the time of Dante and the guelfs and ghibbelines. Originally the front was quite a bold green and white stripe, bleached by 700 years of sun to a more sedate rhythm of greys. I am not sure about the clock tower, bit brummy to me, but at least you can see what time it is. Monza in the 1300's when Italy was all about communes and city states, went guelf, then ghibbeline, falling quickly under the control of the Visconti family from nearby Milan; it lost many of its ancient Lombard monuments including the city walls and the castle, but gained this fantastic gothic facade. Much simpler and smaller than the one in Milan, but also a hundred years older. It was the weekend when I finally got around to visiting the duomo, in a quiet island of stone away from the carneval of weekend walkers crowding the main streets, and centuries away from the mad traffic that fills the outer band of roads. I found it surprisingly full of worshippers, considering it was Saturday afternoon. Everyone else was snapping away so I went bold and took one of my own. Then creeping down the side aisle and out into a fine square courtyard, I found my way to the museum, underneath the church, beautifully laid out. There were no less than 4 young and heavily made-up women manning the ticket desk, combined age less than 70. They asked me, in their clipped little accents, if I wanted to see the iron crown as well as the museum, I didn't know what the iron crown was. Sure why not. They sound like they're speaking arabic here, by the way, not in the sense that it is incomprehensible, it just has the same high pitch and sharp little sounds to it, a very odd sensation to be idly eavesdropping, and have for half a second the thought that you've suddenly acquired the ability to understand arabic. So the iron crown turns out the be The Iron Crown, the crown of the Lombards, the one Charlemagne and Napoleon were crowned with. It is quite tiny, nothing like the British Crown and one can easily see how Boney could have snatched it and stuck it on his own head with a single gesture. 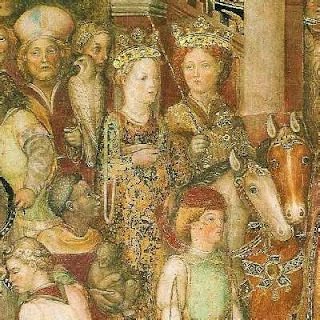 It is kept in a chapel right next to the main altar, naturally Theodolinda's chapel, which has amazing frescoes that were being restored (this pic is nicked from the web) with some of the nicest horses ever fresked, I think you'll agree. The Sacrestan wouldn't let me in to see the crown to start with, well. not just me, he wouldn't let anyone in, we were 'some' minutes early. He couldn't say how many. So back down to the museum, where the gaggle of girls seemed very unsurprised by his behaviour, and started telling stories about him to each other for the benefit of the entire building it seemed to me. I moved on, past case after case of spectacular medieval art, like this beautiful pair of ivory plaques showing th Poet and his Muse . Looks like the Muse is doing all the work to me, what a surprise. One of the cathedral's most famous treasures is this set, the golden Hen and with her seven chicks, (were there originally 12 as made possibly as long ago as the 5th century, and an allegory of maternal love you'll find throughout art history. Nice imagery for the queen who managed to make peace between the Pope and her husband, the agressive King of the Lombards. In exchange for all this help, Gregory the Great gave Theodelinda (but not, preumably, hubby, do I sense some passive aggression?) the iron crown, which isn't all that iron at all. The iron bit comes from the original crosspieces that arched over the top of the golden circlet. They were made, legend has it, from one of the three nails brought back from Jerusalem by Constantine's relic-hunter mum, Helena, some 250 years before Theodelinda's time. and finally some freasky stonework. Next time, I'm off to Milan!